Organisational, communication and logistic support provided by the EMODnet Secretariat in collaboration with Secretariats of European Marine Board and EuroGOOS. Since 2015, the European Marine Board and EuroGOOS have been working in partnership to advance EOOS from a concept to a concrete initiative designed to align, integrate and promote Europe’s complex and fragmented ocean observing capacity, guided by an EOOS Steering Group. Within the scope of this, these organizations identified the need for a gathering of stakeholders in 2018 to advance the EOOS process and gather support from a wide base of stakeholders. It was agreed to combine efforts with the EMODnet Secretariat to organize a joint multi-day EOOS Conference in autumn 2018 gathering support and commitment from the widest possible remit of stakeholders, as a complementary follow up to an EOOS forum to take place on 8 March 2018 focusing on sustainability issues and national operational observing activities. This approach will ensure all drivers, actors and stakeholders converge and join forces to create maximum impact. assess the EOOS strategy and implementation and identifying further concrete joint actions to advance the EOOS agenda. 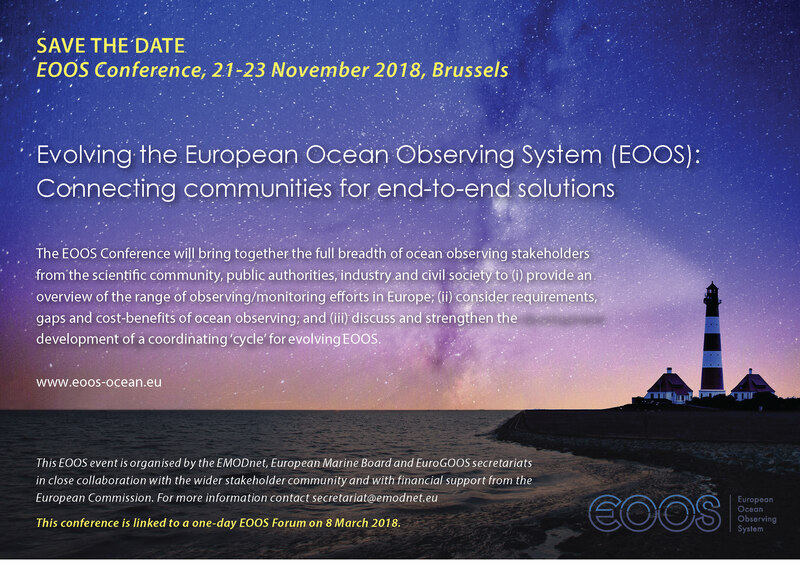 The scope of the Conference is fully in line with the scope for EOOS itself as envisaged in the EOOS Consultation document: all-encompassing, taking into account the systematic collection of all kinds of data from the marine environment, focusing on the European effort, but set within a global context. The ultimate aim is to ensure a well-coordinated ocean monitoring/observing activity to increase our understanding of the short-medium to long term changes of the system and to underpin an ecosystem based management of our marine and coastal environment which supports blue green growth. The Conference should address and progress the four main actions underpinning the development of EOOS: (i) Align and connect existing initiatives to ensure efficiency and value for money; (ii) Identify gaps in the European observing capacity and foster initiatives to fill those gaps; (iii) Promote observing capacities which can benefit multiple sectors including research, policy, management and industry; and (iv) Ensure that European ocean observing is integrated into the global observation system(s) by providing a focal point for interaction with international programmes (e.g. GOOS, GEOSS) and partner initiatives outside of Europe. How can the above range of efforts be joined up? How does it fit into the global landscape? The EOOS Conference will follow on from an EOOS Forum which will take place on 8 March 2018 in Brussels. Ebbe und Flut sind das Ergebnis der Rotation der Erde und der Strudel.